While on our recent trip to Baton Rouge, our family visited Nottoway Plantation House. Since we were trying to incorporate Louisiana History into our recent trip, we knew Nottoway Plantation would be a perfect combination of education and beauty. Nottoway Plantation is one of the largest antebellum plantation houses in the south, is composed of 64 rooms, 7 staircases, and 5 galleries. Words, nor my pictures, can truly showcase its natural beauty but I’m attempting to do so. Nottoway Plantation House is roughly 45 minutes from the Baton Rouge Area. We left right after breakfast and made our way to the Antebellum house since tours started at the beginning of every house. Walking towards the plantation was such a gift! My grandparents had a home built prior to the 1900’s in Louisiana’s Honey Island Swamp area so you can imagine all the emotions I felt inside. Let’s just say I may have threatened reminded my 8 year old son how important it was that he not TOUCH while we enjoyed our tour. The 53,000-square ft plantation home was constructed by John Hampden Randolph in 1858. From what our tour guide mentioned he had wanted to build the plantation to encompass Southern Charm with European details. He worked very hard to accumulate the funds to build his mansion (and his sugar cane plantation) that he wanted to show off his hard work with his home. Randolph, whose father had come from Virginia in 1820, purchased the area in 1841. In 1860 Nottoway Plantation encompassed 6,200 acres and Randolph, the builder and owner of the property during that time, owned 155 African-Americans that worked his sugarcane plantation as slaves. He chose New Orleans Architect Henry Howard to design Nottoway. Henry Howard himself was very important to Nottoway Plantation House & to Louisiana Architecture. Nottoway particular was build as a Greek Revival home. Unlike many homes built at the time, Nottoway was not built by slaves but by European builders. Howard designed plantation homes like Nottoway including those at Madewood, Woodlawn, and Belle Grove to name a few. The techniques and advancements of Nottoway plantation Home were very impressive. My husband is an electrician and received a woodworking scholarship after high school. He has an eye for detail and within the first few minutes to our arrival, my husband started to notice several aspects that were advance for the home’s. I hate going places with him, because he is usually on target with his assumptions. Ha!! Features like modern bathrooms with running water, a gas plant providing gas lighting throughout the home it also had an elaborate bell system in each room. Each room sounded a different bell which rang in the servant’s quarters. Being a large plantation home, the house servants were able to locate which room was needing their attention. In a sense, it was what we think of as a modern day intercom system. As you can see in the collage above, the detail to the home is quite impressive. Our tour guide mentioned that the floor we were on was where Randolph pours his money into. 22 exterior columns, 12 hand-carved Italian marble fireplaces, exquisitely detailed plaster frieze moldings, 15½-foot ceilings, 11-foot doors can be found throughout the home. A lavish pure white oval ballroom (featured above) was called “The White Room”. John Randolph married his wife Emily Jane Liddell & had eleven children,7 of which were daughters. With 7 daughters he knew he would be holding many balls at his home and thought that a solid white room would showcase his daughter’s natural beauty. Makes perfect sense to me! One of his daughters, Cornelia, become famous for writing her diary “The White Castle of Louisiana”. White Castle is the name of the town the Antebellum now sits on. The details in the furnishing are impressive. Most of the furniture in the home are family furnishings. My daughter loved the music room. While there was not an original music room in the home, they recreated what a music room during that area consisted of. The very weekend we arrived at Nottoway Plantation, one of the furniture pieces had just been appraised at 70K. Naturally it was roped off so I couldn’t get a good picture but I’m going to dig through our other camera and see if I can find it later. Isn’t the picture above gorgeous? I took the picture above from the 154 year old original glass window. The story of the Nottoway Plantation home is very impressive. I won’t go into full detail but the home miraculously managed to be avoided from the ramifications of the Civil War. The home did see 1 small canon shot which was located within an exterior column until the 1990’s when the canon finally fell out. It is so nice to see the a piece of Louisiana’s History still in tact & is still as beautiful as it once was almost 155 years ago. You can visit the Nottoway Plantation Website, on Facebook or on Twitter. Wow. That place is absolutely gorgeous. I love to visit places like that, but I think I might be afraid to take my kids there. I can’t even imagine living in a house that big–of course I’d love to especially with all that land. However since I don’t live anywhere near there I will just have to drool over the pics you took! Wow, that place looks huge. I would love to visit. What a wonderful place for photos. The property and all the furnishings look stunning. I bet that was just a wonderful history lesson. 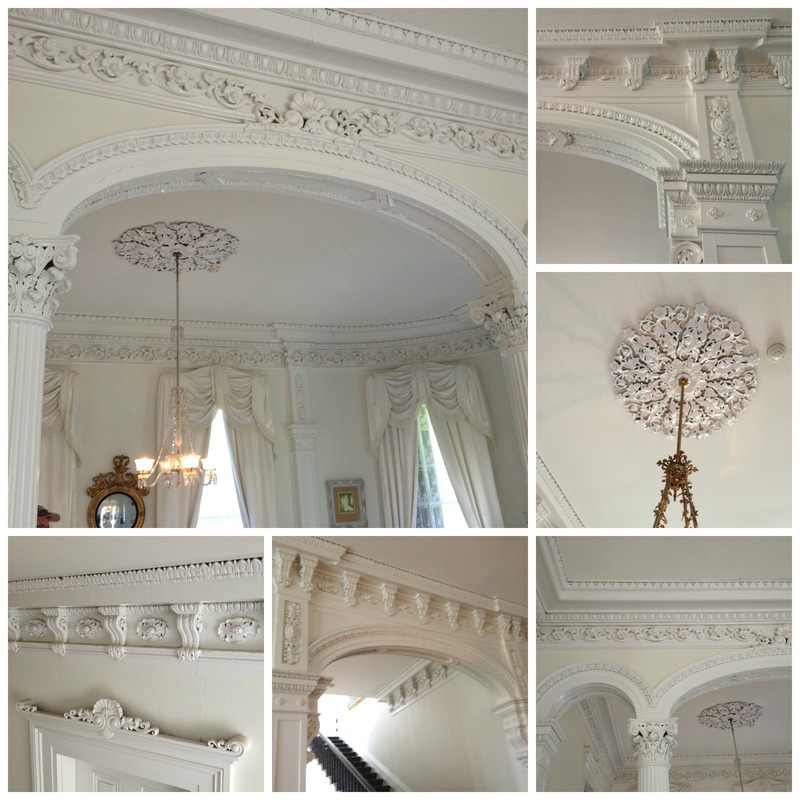 The restoration of the property is amazing. Everything looks so pristine. This part of American history was an ugly time, but the beauty of the architecture and details of the homes are usually nice to admire and remember. It’s a great experience for kids too. That Plantation home is amazing, and I am glad we got to see the inside because as soon as I saw the outside, I wanted to know what it was like inside. What an incredible place. You must have been able to hear the echo of your voice in those rooms. Beautiful. This plantation is beautiful, I’d like to visit. That place is just stunning! I love the grand charm of southern plantations. OMG beautiful place! I’d love to visit this place!! Gorgeous place, you made me want to go to Louisiana! What a gorgeous plantation home, I just love gorgeous Southern homes! What a stunning estate! I love to visit historic homes and this is one that would definitely be memorable! 53,000 square feet? I can’t even imagine living in something that massive. Great post! wow, what a unique, classic, immaculate house! wish we could see it for real!